Conventional clamping devices, such as jaw chucks or mandrels perform two functions: Centering and clamping. TALEMENT, on the other hand, is a clamping fi xture that is designed exclusively for clamping. However it is extremely effi cient in performing this function. TALEMENT is a highly elastic membrane that is preferably actuated with air, but it can also be actuated with liquid media. 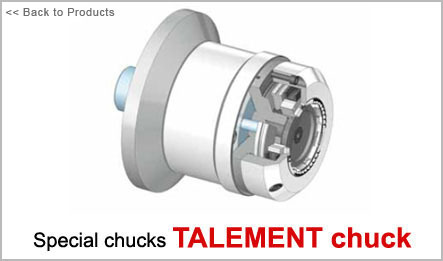 As a jaw chuck the chuck has wear-resistant segments that have been joined through a vulcanization process. Due to the high elasticity of the membrane the element follows the form of the work piece and thus prevents excessive deformation. Even formal deviations in the millimeter range can be easily compensated with TALEMENT. The clamping elements are fi rmly clamped after placement. Whether short or long, TALEMENT is ideal for out-ofround and thin-walled work pieces such as pipe sections, rings, or all fragile components. Sometimes the results even surprise our experts. Combined with the vibration dampening effect this »compensating clamping« is a genuine workholding revolution.